dandy contributor Albert Koehl writes that our transport system has one simple problem: too many cars. And there's one simple solution: more cycling, walking, and mass transit – but we have to fight for it. Change usually requires conflict. This observation would serve Ontario’s cycling (and pedestrian) advocates well. Polite advocacy has earned cyclists hearty pats on the back, or derision, but has not achieved the road safety improvements that would protect cyclists and draw enough people out of cars to help cure our dysfunctional transport system. Private cars dominate public roads. The rise of the car was itself the result of a conflict largely played out in the 1920s, as described in the book Fighting Traffic. At that time, roads were still shared spaces crowded by electric streetcars and pedestrians. Car owners were an often-vilified minority for the high death toll exacted on pedestrians, especially children. A well-financed car lobby, strategic political interventions (including criminal manipulation of the transportation system in the U.S.) and an appeal to values of liberty and independence helped secure the dominant place of the car in our society. Almost a century later the consequences of car-centred transport have come into focus: massive, but somehow always inadequate space for roads and parking; a tragic number of fatalities involving motor vehicles (around 300,000 Canadians since 1920); the destruction of landscapes; toxic air, massive, unsustainable fossil fuel consumption; and big increases in household transport spending. It’s difficult to question the benefits of cycling, so ad hoc excuses for inaction are crafted. Prejudice, muddled thinking (emboldened by the illusions created by auto advertising), and inertia characterize the excuses. 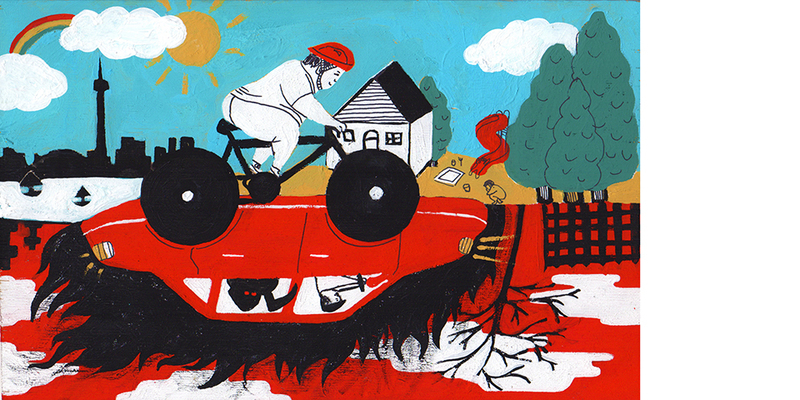 Instead of acknowledging the inherent danger of cars, cyclists are blamed for their own deaths – sometimes because other cyclists misbehave (or because some don’t wear helmets.) Cyclists and bike lanes, instead of too many cars, are sometimes even blamed for congestion! For pedestrians, even wearing the wrong clothes can be enough to rationalize a death. Conflict isn’t necessarily a precondition to change. It’s possible that enlightened leaders will appreciate new evidence, concepts of fairness, and the demands of opposing groups. Unfortunately, history shows that those with power rarely see the value of sharing, without forceful prompting. Since most people, most of the time, prefer to avoid conflict the status quo persists despite obvious injustices. The status quo isn’t a neutral or benign position. Our transport model has huge hidden costs and violent implications – to our air, our climate, our land, and our lives. In the past months here in Toronto, two (helmet-wearing) women aged 25 and 51, and an accomplished young squash player, engaged in the otherwise healthy, joyful activity of pedalling their bikes were killed after being hit by motor vehicles. Pedestrians have fared worse with 38 deaths so far this year, including seniors and children. The only guarantee for families is that the bloody scene will be quickly sanitized. Meanwhile, the safety recommendations from both Ontario’s Chief Coroner and Toronto’s Medical Officer of Health are given scant attention. The demand for bike lanes on Toronto's Bloor-Danforth roadway --- identified in a 1992 city report as an ideal east-west route --- is routinely dismissed with smug answers about the irreplaceable value of parking to local businesses (as if shoppers on bikes don’t count). Our group (Bells on Bloor) approaches advocacy with positive events and proactive actions, including annual cycling parades, petitions, children’s contests, City Hall deputations, public consultations, op-eds, letter writing, meetings with civic officials, publicizing reports on the small contribution of motorists to local shops, and documenting broad community support. All of which garnered us … the promise of yet another study. On Jarvis Street, bike lanes were removed even though a city traffic study showed that traffic had actually increased after one of the motor lanes was converted into bike lanes. When it comes to traffic, many civic officials can still only think of cars. It should be no surprise that Toronto has only about 110 km of bike lanes on a 5200—plus-km road network. There are indeed two opposing forces, and competing values, that underlie the current transport debate. On one side is a car-dominated system that prizes individual freedom and liberty while awarding entrenched interests, including car-makers (who continue to ship jobs abroad) and oil corporations. On the other side are community interests in efficiency, safety, affordability, and a clean environment better served by transit, cycling, and walking. The car lobby’s “war on the car” rhetoric was successful in reframing and twisting the larger debate about an efficient transport system --- built on transit, cycling, and walking --- into a personal attack on motorists, many of whom actually share the individual and societal goal of moving people and goods from A to B in a rational fashion. The objective of the rhetoric was simply to divide the community along distorted lines. “In politics, you get attacked because you matter” according to a recent Boston Globe article titled, Conservatives' new enemy: Bikes. In sounding apologetic for demands in the face of the “war on the car” language, cycling advocates may have misapprehended our growing power. If bikes are indeed becoming the Conservative’s new bogeyman (as the Globe article suggested), this should encourage a ramping up of the push for cycling safety, instead of a softening of demands. At the very least, cyclists need to recognize --- in the current context --- the unavoidable importance of conflict in the struggle for safe passage on public roads. Cooperative approaches to change are worth pursuing but, as many advocates have already realized, it’s a mistake to restrict oneself to such approaches when any kind of dissent is simply swallowed up in business-as-usual processes and mere tinkering with the car-dominated reality is offered as a serious response to cyclists’ demands. Conflict must not include violence (or even meanness), but it does mean aggressively challenging the existing car-first status quo. Politicians, businesses, and corporate interests that stand in cyclists’ way must be shown that there is a penalty to pay. Building alliances, especially with pedestrians (in part by showing greater courtesy) and boldly protesting for a public road system that respects cyclists and other vulnerable road users is an important part of the path forward. Since we cannot solve our transport woes with more cars, the new direction must include more space on public roads for efficient means of transport like cycling. Powerful corporate and political interests, along with strong cultural influences, have made it clear that cyclists will not succeed without a fight. It’s our job to make sure we deliver it. Albert Koehl is an environmental lawyer and founding member of Bells on Bloor. He was on the Ontario Chief Coroner’s expert panel on pedestrian safety. Stay tuned for our special bike plan election issue in 2014! We think to get things done, you need a plan – and if you want bike lanes, you need a good bike plan. We’ll be interviewing all of the mayoral candidates, asking them what their bike plan looks like and much, much more. Local business owners on Bloor want bike lanes. Watch the video here. Winter issues past: 2012 and 2013. Our next winter issue is due Jan/Feb 2014 and will feature dandy staff picks for best winter gear.